Supplementary material reads: "Ward club. 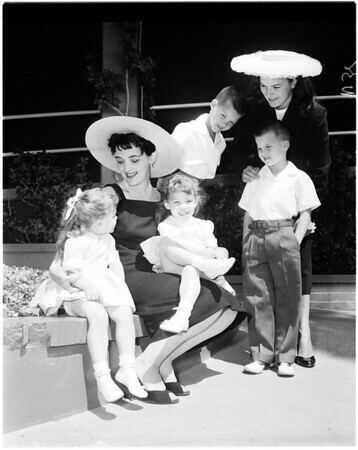 Photo assignment for Friday, April 25 at 1 p.m. Friday April 25 at 1 p.m. Hollywood Mothers of Twins picture, to be taken at Hollywood Roosevelt Hotel. Ask for Mrs. E.W. Roberts at desk. Picture release May 11, Mother's Day. Two mothers and 2 sets identical twins in picture".